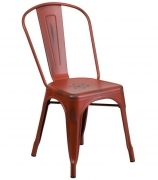 Our metal restaurant chairs have Style, Durability, Comfort and Craftsmanship. These versatile chairs are long-wearing and attractive, made with dependable materials some of which can also be used outdoors. At Restaurant Furniture Canada we have colors, finishes, and if upholstered, beautiful and durable fabrics from which to choose. Some styles are even stackable to save space and allow easy storage. Many chair styles that look like they’re made of wood are actually metal. That's because design and construction advances have helped in creating fabulous chair designs that have the same style and comfort of solid wood chairs. In addition, our commercial chairs are a great match with any décor. Our vast selection makes it easy to find bar furniture for all your seating needs. Our designs range from chic and contemporary to classic, timeless styles, so you can match your current theme or start a new one easily. Our low prices and fast shipping mean you can get affordable, high quality chairs for your restaurant in as little as 7-14 business days.